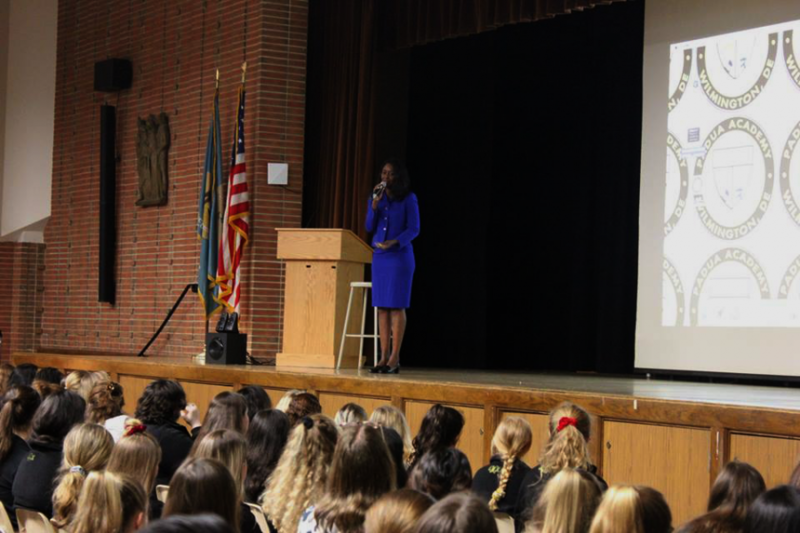 Immaculée Ilibagiza addresses students, discussing her story of survival, finding God, and forgiveness. 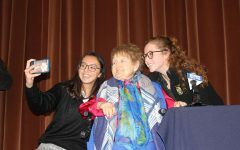 She spoke to students and teachers on April 10, 2019. Immaculée Ilibagiza spent 91 days of her life in a tiny bathroom with seven other women, hiding from the genocide taking place outside the door. The perpetrators had once been her neighbors, her friends, her classmates—but now they wanted her dead. The Rwandan genocide that took place in 1994 killed approximately one million of the minority ethnicity, the Tutsi. The perpetrators, the majority Hutu ethnicity, had been engaged in a civil war since 1990 with a Tutsi-dominated rebel group, the Rwandan Patriotic Front (RPF). Under Belgian rule earlier in the twentieth century, Tutsi had been granted preferential treatment, creating a rift between the groups. These divisions festered for decades, coming to a head when Hutu president Juvénal Habyarimana’s plane was shot down on April 6, 1994. Seemingly within minutes, the genocide began. “Men, women, and children, including her entire family except for one of her brothers, were massacred at the hands of Hutu marauders,” said Ms. Liang, who helped to organize Ilibagiza’s visit. During her time in hiding, Ilibagiza dedicated herself to her faith, learned English, and committed herself to a “life of peace, hope, and forgiveness.” She has since worked with the United Nations, written seven books, and received the Mahatma Gandhi International Award for Reconciliation and Peace. She was Padua’s first Women’s Achievement Award winner in 2009. Ilibagiza was a college student when the genocide began. She had just returned home for Easter, enjoying the company of her family for just three days. One morning just over 25 years ago, everything changed. To her, it still feels like yesterday. She felt that God had made it clear what was coming. Propaganda against the Tutsi minority was being broadcast over the radio, and tensions were rising. After the president’s plane was shot down, the borders of the country were shut and the killings began almost immediately. Ilibagiza was instructed by her father to go to a neighbor’s house, where she was told to hide in the bathroom. She would never see her family together again. She could not comprehend how she could hide in such a small bathroom—and then seven more women joined. She lived those 91 days in the bathroom in almost complete silence. She asked for a radio to be put outside the bathroom door. On the radio, she heard the horrors that were unfolding in Rwanda. “Even if you are smart in the head, if you don’t have the heart, if you don’t have love, if you don’t have values to lead your intelligence, you can only be smarter to know how to destroy,” she said. When the killers came, Ilibagiza thought death was upon her. There was nowhere to run. They searched the house, but stopped before opening the bathroom. ‘We trust you, you’re a good man,’ they said to the pastor. She considered it a sign from God. She became ashamed of the anger she held in her heart. Through prayer and reflection on the Bible, she realized that the biggest challenge would be loving everyone—even her enemies. It felt like a weight was lifted from her shoulders—she felt that God was telling her to stay on “the side of love,” not hate. Her parents were killed. Her two brothers, her grandparents. Her neighbors and her friends, among the million slaughtered by her fellow Rwandans. When she found out, she screamed and cried. She did not want to pray. But then she felt the hand of God, holding her. When she left the bathroom after 91 days, she went to a refugee camp with nothing left but her faith. Ilibagiza signs a book for Audrey Lamb, a senior. She stayed after her lecture to sign books and discuss her talk with students. 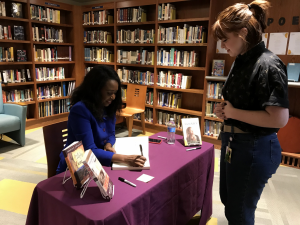 Alix Sikorski, a student in Mrs. Markham’s 20th Century Genocide class, felt it was “breathtaking” to hear from Ilibagiza. April 7, 2019 marked the 25th anniversary of the beginning of the Rwandan genocide. President Paul Kagame addressed the nation, emphasizing healing and new beginnings.